On 30 April, Lauren Good, the new Senior Program Officer from the Bill & Melinda Gates Foundation overseeing YIIFSWA, visited with the project implementers at IITA-Headquarters in Ibadan. 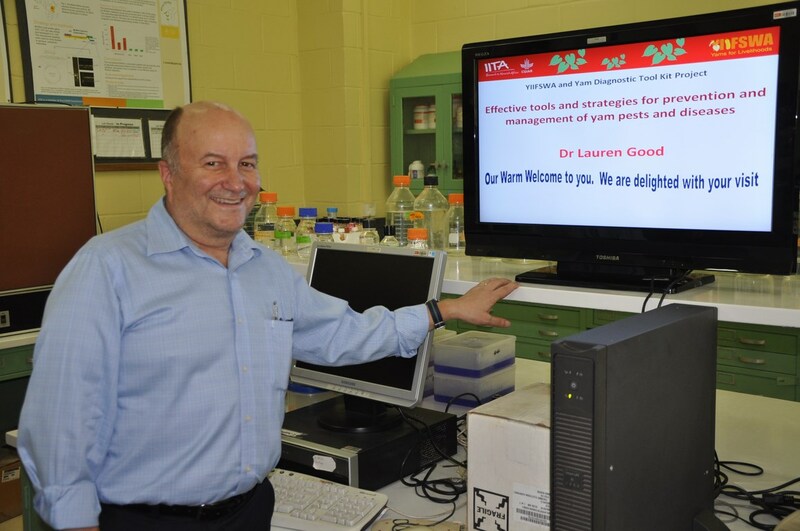 Dr Good spent a day with YIIFSWA’s core team to learn about the project and its achievements so far. Good met with the Director for West Africa Dr Robert Asiedu, Project Leader Dr Norbert Maroya and the other team members, including Drs Beatrice Aighewi (seed specialist), Antonio Lopez (yam breeder), Morufat Balogun (tissue culture specialist), Djana Mignouna (regional economist), Katherine Lopez and Oiwoja Odihi, (YIIFSWA Communication). Regina Kapinga, former program officer, Gates Foundation, and now IITA’s new Head of Advocacy and Resource Mobilization, also attended the discussion. The Senior Program Officer, only 11 days on the job, was shown the aeroponics and bioreactor systems for seed yam production, and the diagnostic tools for virus indexing and the quality management protocol for seed yam certification developed by the project. 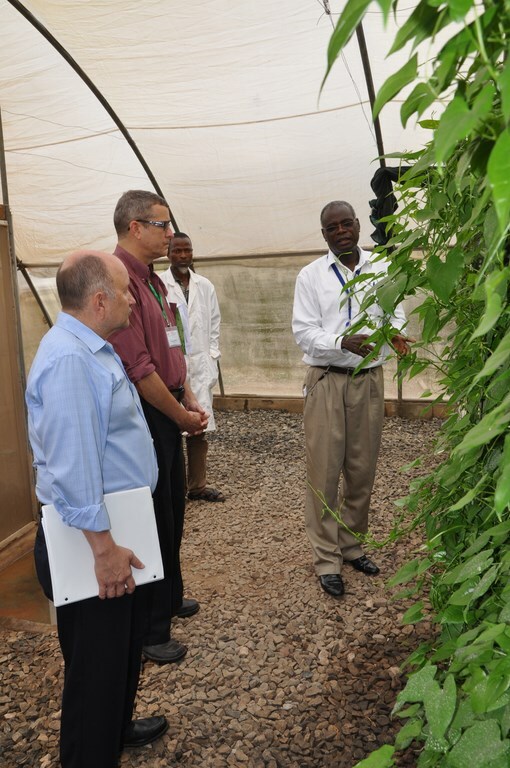 Dr Norbert Maroya shows yam plants grown in the screenhouse using the new technologies. According to Good, a key take-way from the visit was that through these innovations, the actors within the formal seed systems can rapidly develop and recommend new varieties and also boost the production of consumer-preferred varieties. 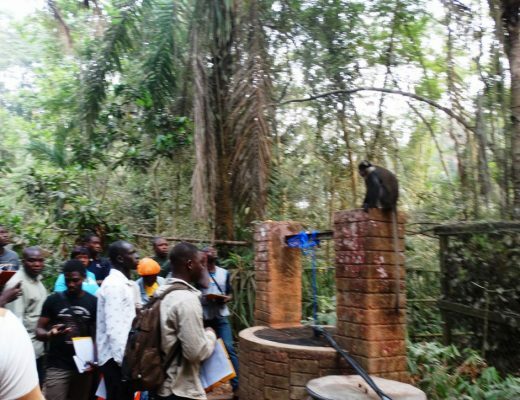 Although he was excited about the research novelties Good was also concerned about the impact of using these technologies on smallholder farmers. He was pleased to hear that new NGOs had been enlisted to help work with local communities based on the comment from the external reviewers about having ‘more boots on the ground’ to effectively facilitate the dissemination and adoption of existing technologies among smallholder farmers in Ghana and Nigeria. This would help the project meet its goal of reaching 200,000 smallholder farmers in Ghana and Nigeria. 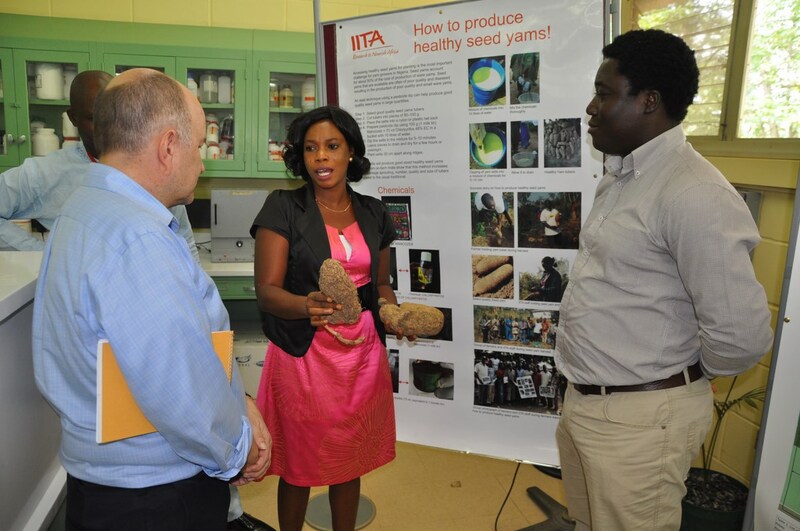 Lauren Good of the Gates Foundation listen as IITA staff explain the process of producing healthy seed yam. In the discussion with the project team, Good stated that ‘his role as the Senior Program Officer is to support the Project Leader and the project to ensure its success, because the Foundation is concerned about making sure that farmers are producing better yam with better yield, and less problems with viruses and nematodes. Yam plays a key role in ensuring food security and sustainable income generation for millions of smallholder farmers and their families in Ghana and Nigeria. However, the unavailability of quality seed tubers and the dominance of pests and diseases limit the smallholders’ productivity. By using quality seed tubers, pest and disease management, and technological packages that would improve farm management, smallholder farmers can increase their current yield.